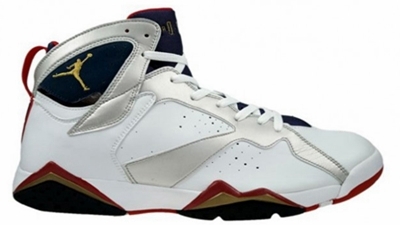 The rumors have been confirmed after Jordan Brand announced the official release date of the Air Jordan 7 Olympic, which will be making a return in the market before the 2012 London Olympics. According to reports, the Olympic-styled Air Jordan 7 will be hitting the market on July 21, two weeks after the release of the Air Jordan 6 “Olympics, which will be hitting shelves on July 7. Although there is no official image as of late, it is expected that this silhouette will be a much improved edition of the one that was released in 2004 (pictured above) before the Athens Olympics that year. This is expected to be a hit so watch out for it!